As in Italian haute couture, the main focus of our work is to meet our customers’ requirements. We listen to needs, take measurements and make gas compressors that can be applied to a number of contexts in the sector of renewable energy. Microturbines can be powered with biogas from various sources: anaerobic digestion of agricultural waste, animal waste, storage of solid urban waste (organic fraction of solid urban waste), treatment of wastewater. The Adicomp packages provide microturbines with compressed and dehumidified gas at the right temperature to optimise their operation and therefore maximise productivity. Moreover, the gas can also undergo further treatments to eliminate certain contaminants, including hydrogen sulphide (H2S) and siloxanes. Namely, the latter can represent dangerous agents inside the microturbine and even cause a seizure: thanks to special filters and other accessories, Adicomp compressors fully eliminate this issue. Many treatments are made possible by additional equipment such as chillers that, as well as completing the compression package, also enhance the quality of the gas for the various treatment stages. Biogas turbines are used in the renewable energy sector and are able to produce a higher amount of energy than that normally produced by microturbines. For these applications, there may be the need for far higher operating pressures that can be reached as required by using boosters. 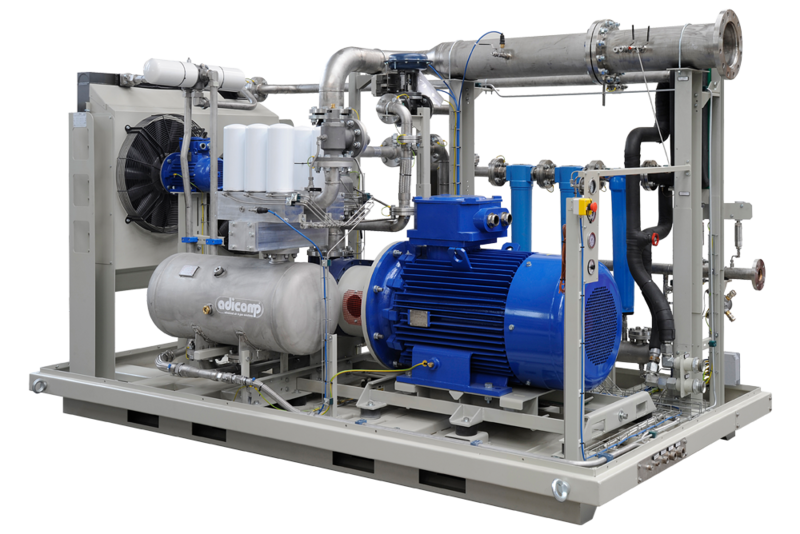 Adicomp is able to supply gas at the required quality and pressure for most turbines used in renewables by submitting gas, if necessary, to various treatments to remove certain contaminants, using chillers produced in-house and filtration systems. Endothermic engines used to generate electrical energy can run on biogas. Usually they do not require compressors, as blowers to increase the pressure by some tens of millibars are enough. 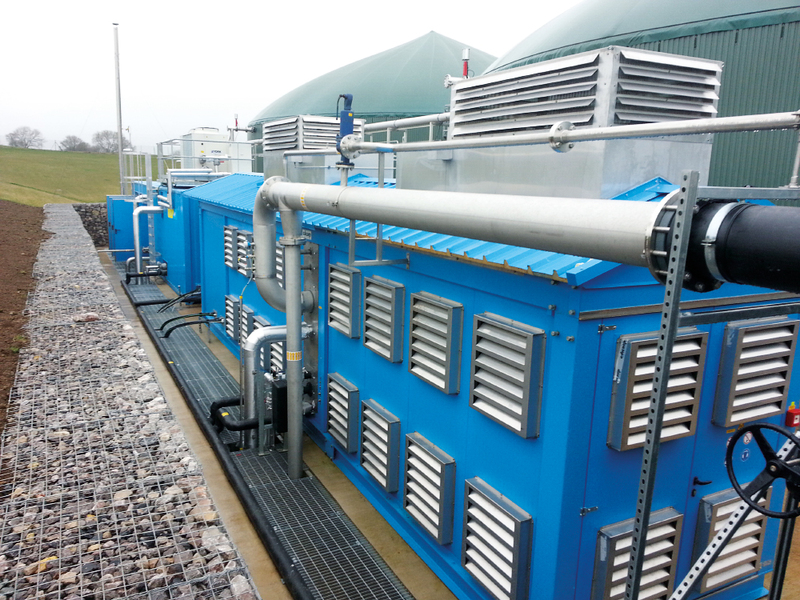 In this regard, Adicomp can provide both blowers and complete biogas treatment systems (fitted with blowers, chillers, filters and heat exchangers) that allow for a better performance of the engine and extend its service life by eliminating condensation and impurities commonly found. In other cases, the engines instead need gas compressed up to a few bar, especially in combination of the pre-heating combustion chambers. Over the last few years the production of biomethane has become the new frontier of biogas. 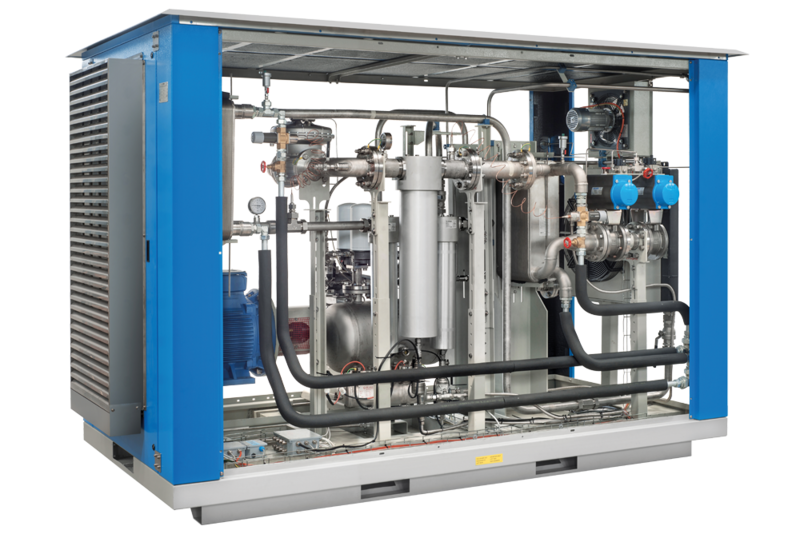 Adicomp is at the forefront of this revolution with its packages: as a matter of fact it has been among the first players in the sector to believe in this application, developing a range of designated compressors for upgrading and is now one of the main partners of the largest biomethane plant suppliers. The main feature of this type of package is that it works at higher pressures compared to cogeneration and, above all, it provides a complete “plug & play” set consisting of gas compression and cleaning. The systems produced by Adicomp are able to remove hydrocarbons and other contaminants in the gases through coalescing filtration systems or activated carbon columns at controlled temperature. Indeed, the system provides a fluid quality suitable to power on the various upgrading systems such as membranes, washes with water and/or chemical mixes, absorption systems (PSA) and mixed systems. 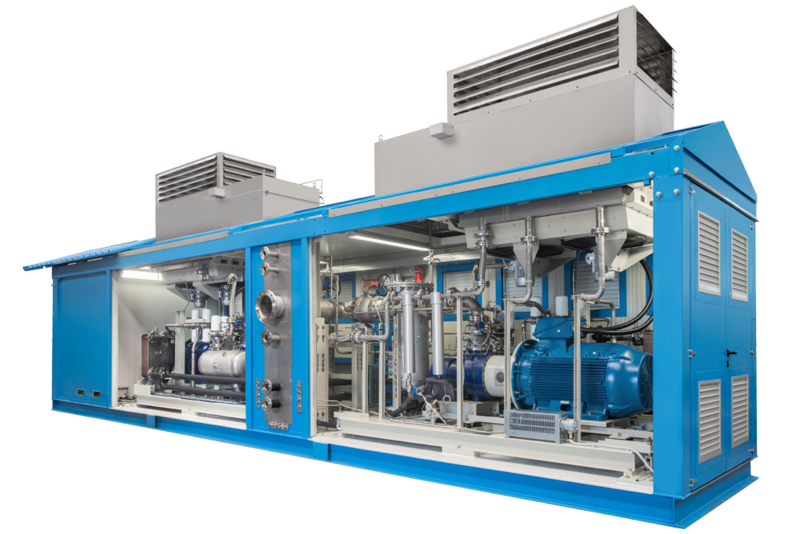 In this system located in the UK, a tailor-made solution was developed on a 40-feet container with two 200 kW compressors, all managed by a PLC. Here the biogas is compressed and sent to a treatment system that supplies the downstream membrane upgrading unit. The biomethane produced is fed into the national grid. Inside the container, Adicomp also provided a heat recovery system from the oil, which allows the water (used for various uses on site) to be heated, thereby reducing energy costs by up to 80%.